Sorting through all those colleges can be daunting. Follow these tips to organize your college search…and keep your sanity. And don’t forget to use a handy college search spreadsheet to keep track of it all! Make sure to ask yourself: Where can I keep college search materials so I can access them when I need them? Have I included every single relevant date and event in my college search calendar? Also have one physical place—like a box in your room or a file in a filing cabinet in your house—where you keep any hard copies, like college brochures or notes you took on the road. You need to commit to one calendar too! Whether it’s a paper calendar or online/on your phone, make sure you use one calendar during your college search and admission process. Fill it up with all upcoming deadlines, test dates, scheduled campus visits, and even goals, like “finish first draft of application essay by June 15.” Use it to set automatic reminders too. It’s probably best to make your college search calendar part of your regular calendar too, if you have one, because it’s helpful to know what else is going on in your life when planning college-related things. You don’t want your campus tour of your dream school to be the same time as your little brother’s middle school graduation ceremony. Create an organizational structure that works for you and stick to it throughout your college search. And whatever you do, make a habit of using it regularly. 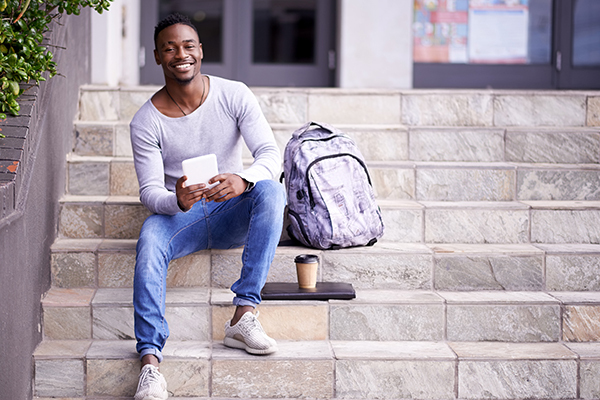 For example, after any campus visit, be sure to write down your first impression notes right away; then make a habit of either adding them to your physical college folder or transcribing them to your digital folder as soon as you get home. Make sure to ask yourself: Is location a large or small factor in my search? Where will I be happiest in terms of atmosphere? What locations have the academic and extracurricular opportunities I want? It’s important to keep location top of mind in your college search. Going far away (like going from your hometown in New Jersey to a university in California) can drastically alter your college experience, not to mention all those hefty airplane tickets for any visit home. College Board has an excellent tool to search for colleges by location, whether you want to stay in state or venture across the country. Make sure to ask yourself: What majors am I most interested in? What kinds of academic experiences do I want to accompany those majors? If you know or have a general idea of what you would like to major in, search for schools that have your major(s). You don’t want to waste money applying to a school only to find out they don’t have anything you really want to study. However, some schools carry the option to create your own major, so check if that is an option should the college not carry your major. Make sure to ask yourself: What kind of academic atmosphere am I looking for? How do my grades and test scores stack up for this school? Granted, admission decisions aren’t all about grades and test scores. And you can get into a school even if your stats are below the norm. (It happens all the time.) But it’s still important to consider how your academic profile—and how you like to learn—stack up at your schools. Remember, colleges and universities can offer really different learning environments: some are super vigorous (and stressful), some are more hands-on, some take a unique approach to classes. Compare your GPA, classes, and maybe class rank to the average admitted student at any colleges you’re considering. (They should have this information readily available on their website. If not, just give the admission office a call.) If you have taken the SAT or ACT already, compare your scores to those of your colleges’ admitted scores. Don’t feel down if your scores are lower: if you are an underclassman or junior, there is still time to learn test-taking strategies, set good score goals, prepare for the tests, and/or retake the SAT/ACT. Make sure to ask yourself: What are my top college choices? Which schools are my reaches, matches, and safeties? What else is important to me in a college? Top choices: Basically your favorite colleges and universities. They might be “reaches”; they might be safeties. Even though you should only be applying to colleges you’d be happy to attend, these top choices are the ones you’d be willing to fight for. Reaches: These are the colleges where you fall below the admitted student profile, whether due to test scores, grades, or other factors. Keep in mind that applying to a college where you know you have no chance of getting into is considered risky, as it not only wastes your money but the time you could have used finding and applying to colleges that really fit you. Safety: Safety colleges are the schools where you have a solid (at least above a 50%) chance of getting accepted. What counts as a safety will differ a lot from student to student, so don’t compare yourself to other people. Don’t underestimate these schools! Have at least two or three safeties. I fell in love with and will be attending my safety school. If there’s something else that’s really important to you in a college—whether it’s having lots of musical groups or a religious background or something else entirely—you can always make that a main part of your college search and organization system. Make sure to ask yourself: What would my parents think? Is there anyone I know who attended college I can talk to? College search advice can be incredibly valuable. People who know you well can help you think through tough issues and remind you of things you might have forgotten. And you can learn a ton from their experiences. If you know someone who attended college, ask them about their search and, most importantly, why they chose their college. Some students choose to attend a family member’s alma mater, either for sentimentality, legacy discounts, or simply high regard for the school. Finally, as much as us teenagers hate to have our parents standing over our shoulder, sometimes their opinion is important. In the case of college, it can be extremely important (especially if they’re footing the bill). Your parents want the best for you, so let them make college suggestions and see if you agree…or not. It’s okay to discuss. How are you organizing your college search and school choices? Leave your tips in the comments, or send them to us on Instagram, Twitter, or Facebook.